Trove has helped soften my need for MMORPG realism preferences, Animal Crossing Pocket Camp also offered some resolve but I’m still not completely at ease and need to know: Is Maple Story 2 enjoyable for someone like me who's also never played the original? Straight out the gate the options and ease of use when creating your character are phenomenal. Jumping between classes, each one has its own personal outfit so of course I had to play dress ups on all eight of them. It’s not just the amount of choices you have, it’s that they aren’t overwhelming plus extend to being able to choose your base outfit, which you can also dye. One glance at the UI encouraged me to wait before I traditionally navigate the entire thing as there's a lot to digest and I am glad I made that choice as so much wouldn’t make sense as a new Maple Story player. The most difficult choice I had to begin with was whether to select “classic” arrow movement while I play, or “click” WASD. I chose classic originally but have found the click option is more optimal on my Wizard especially during the boss kills, zone sweeps and building. More on building in a minute. Movement is a big thing to get use to in Maple Story 2 (MS2) as it is so very easy to forget it’s a voxel until you have to up or down to reach objectives or just explore. Current official events for closed beta have us generously receiving all kinds of mounts from balloon ducks, to shopping carts and an eagle so I’m falling out of the sky on the regular to get places. I’ve also found it entertaining seeing if I can reach/hit places without dying, in between catching helicopter taxis and portal travel. Nexon really know how to ensure we have ample fun questing and adventuring! So, do get in here if you can! I’ll be keeping my eye on this game for sure and launching with it because my first impression of this game is fantastic, and I am now completely at ease with cute overload games especially if they have as much depth and enjoyment as this one. 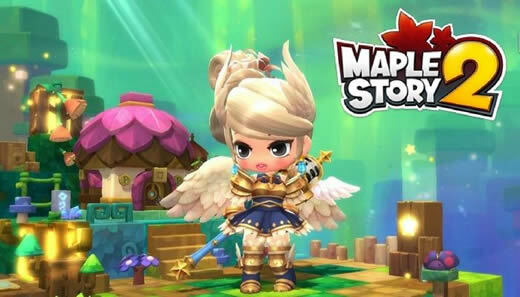 Maplestoryer.com as one of the most professional online store which glad to share more Maplestory News and cheap Maplestory mesos buy with instant delivery.